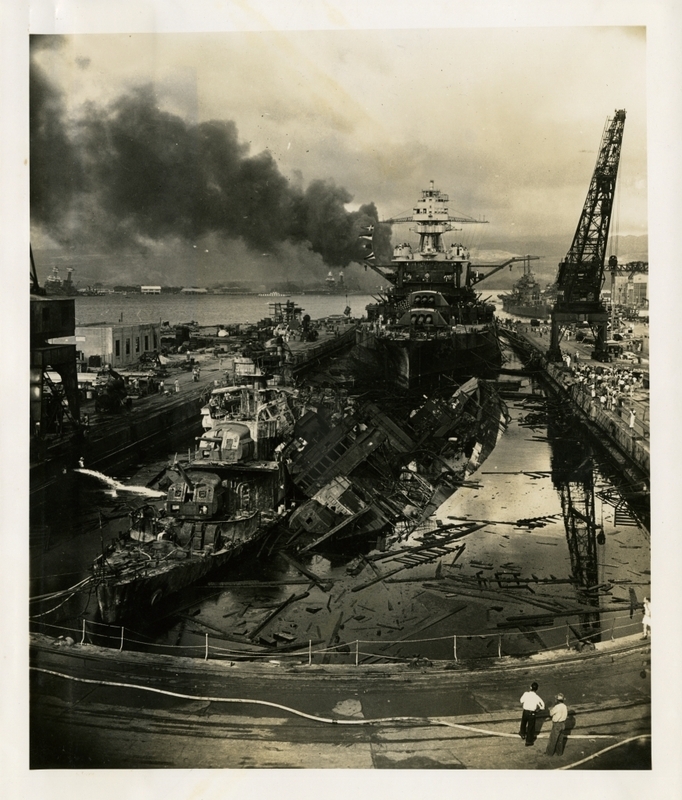 The jumbled mass of wreckage in the foreground of drydock No. 1 are the U.S. destroyers Downes (left) and Cassin (right). The battleship in the rear is the USS Pennsylvania, 33,100-ton flagship of the Pacific Fleet, which suffered relatively light damage during the Japanses attack. The Pennsylvania was repaired shortly after the attack. Main and auxiliary machinery fittings of the Downes and Cassin are being transferred to new hulls. While initially thought to be complete losses, both the Cassin and the Downes would return to full service before the end of the war. This photograph is part of a series of photographs from the U.S. Senate investigation of the Japanese attack on Pearl Harbor, 7 Dec. 1941.